There has been plenty of activity on energy efficiency in the US Congress lately. Introduced in September 2015, The Energy Policy Modernization Act of 2016 (S.2012) was passed in the Senate in April 2016. The bill contains provisions that would be the most significant energy efficiency policy package since 2007. It moves the ball forward on energy efficiency, toward consumer energy bill savings, more jobs, and cleaner air. 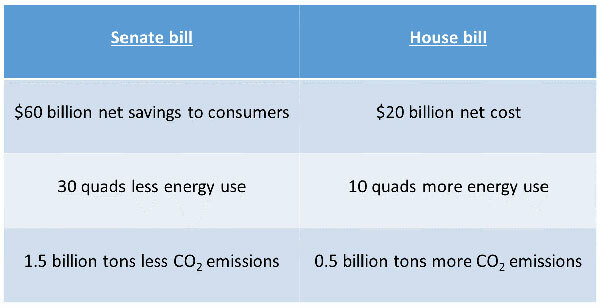 Many of the energy efficiency provisions are based on the Energy Savings and Industrial Competitiveness Act (Portman-Shaheen bill S.720 in the Senate; McKinley-Welch in the House). In December 2015, the House of Representatives passed its bill, H.R. 8. However, dubbed The North American Energy Security and Infrastructure Act of 2016, the House version of the bill contains provisions that we believe would result in an increase in energy use overall. Given the major differences between the bills, the House and Senate have appointed a conference committee with representatives of each chamber to try to agree on a compromise. If the conference committee reaches an agreement, it will report back a single version of the bill to the House and the Senate for approval. If both chambers pass the bill, it will go to the president’s desk for his signature. 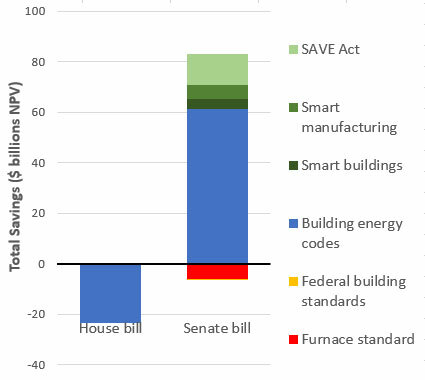 Senate Section 1001 on building energy codes would, in our analysis, have by far the largest impact on energy efficiency. It provides additional support to states to help them protect homeowners and renters by ensuring new construction is not wasteful. House Sections 3141 and 3142, on the other hand, would result in more energy use by restricting the Department of Energy’s assistance to states and local governments. Senate Section 1103 on furnace efficiency standards would delay and damage an essential federal efficiency measure and reduce savings. House Section 3123 provides much better alternative language that would foster cooperative resolution of this issue. Senate Sections 1501-6, the SAVE Act, would improve the accuracy of mortgage underwriting and enable energy efficiency improvements. Lenders would consider the benefits of energy savings for home value and for homeowner expenses when setting mortgage caps. The provision now applies only to FHA mortgages. Senate Sections 1014 and 1201-3 would direct the Department of Energy to support current rapid innovation in smart buildings and smart manufacturing respectively. The use of new sensors, controls, and software promises dramatic savings but needs additional research and testing. Download a summary of our analysis. The full report can also be downloaded here. The Alliance to Save Energy has more information on each of the key energy efficiency provisions.